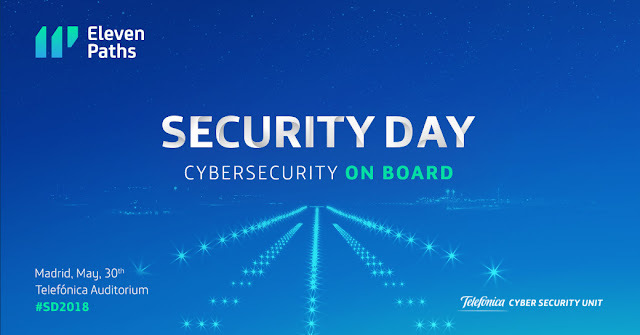 Today was the fifth edition of the Security Day event, organized by ElevenPaths, the Telefónica Cybersecurity Unit, which took place in Madrid, under the slogan "Cybersecurity On Board". This important event brought together more than 400 people, and served as a framework to present the new technological integrations carried out with strategic partners, with the aim of helping companies to combat cyber-attacks against their technological infrastructures. The company's cybersecurity unit works to accompany its clients on their digital journeys, providing end-to-end protection and peace of mind. Telefónica continues to establish itself as an Intelligent MSSP (Managed Security Services Provider), to offer end-to-end cyber-resilient solutions to all its clients and to provide greater security to organizations in all aspects of their day-to-day operations. Today, ElevenPaths presented ‘Conexión Segura’, a new solution to bring security to all of its customers’ homes. This solution automatically protects clients' HGU (Home Gateway Unit) routers with a McAffee antivirus, without requiring them to download anything, and the protection is extended to all devices, including the encrypted part of the VPNs, and it also comes with parental control. Telefónica's Cybersecurity Unit announced new updates to the existing product Latch, the security switch for companies’ and individual users’ digital lives. It also announced the integration of new products such as Shadow Online, a tool that enables the traceability of documents through the use of invisible digital watermark techniques, FaasT for WordPress, which facilitates persistent penetration testing for websites based on this technology, and the Managed Detection & Response (MDR) service, which aims to help companies by improving the way that they detect threats, respond to incidents and monitor their IT (Information Technology) assets. At the same time, several collaborations were presented with manufacturers that incorporate products with ElevenPaths technology. The collaboration between HP Enterprise and Telefónica has succeeded in integrating Mobile Connect into the ClearPass product, allowing the authentication of users in the network through a mobile phone, followed by the application of a complete security policy. The Metashield and Shadow Online products have also been integrated to enhance SealPaths’ DRM solution capabilities, and Panda Adaptive Defense has been integrated with the LogTrust technology to provide a solution that helps with GDPR compliance, allowing the identification and location of personal data. Also highlighted were Telefónica’s new acquisitions and investments made in companies and leading start-ups from the cybersecurity field. One example is the acquisition of Dinoflux for the mass analysis of malware, the generation of real-time threat intelligence, and the sampling of IoT products (IoT Anomaly Detection). Another example is its investment in the company Govertis, with the renewal of the collaboration and innovation agreement for the improvement of the SandaS GRC product, acquired 3 years ago. This day comes a few weeks after the creation of the first Global Telco Security Alliance between telecommunications operators, an agreement signed by Etisalat, Singtel, Softbank and Telefónica, with the aim of achieving operational and economical synergies and expanding the offer and accessibility for more than 1.2 billion customers. "The alliance will help all its members to offer disruptive innovation to protect the digital life of our customers," said Pedro Pablo Pérez, Vice President of Security at Telefónica and CEO of ElevenPaths.